Our first ever MASSIVE MOVIE WEEK collaboration with Row House Cinema is winding down, but get pumped up for our annual MASSIVE MUSIC WEEKEND, this weekend 2/8 through 2/10! 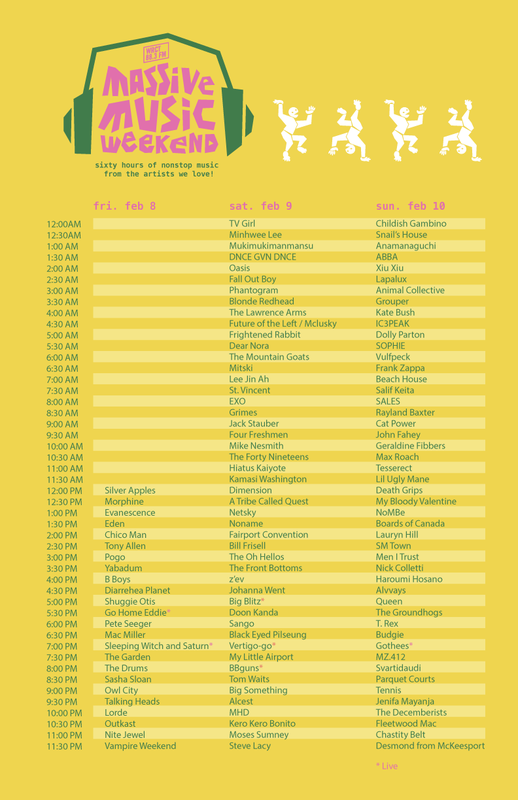 Like past years, we’ve prepared 60 HOURS of non-stop music from our favorite artists, starting at noon on Friday, 2/8 and continuing all weekend long! Every half-hour we’ll feature a different artist, handpicked just for your listening pleasure by our own station members. Check out the full line-up below (open in new tab to enlarge). Props to Connor McGaffin for the amazing poster this year. Massive Music Weekend! Feb. 20-22! It’s that time again… WRCT presents MASSIVE MUSIC WEEKEND! Starting Friday Feb. 20 at 12 p.m., tune in for sixty hours of nonstop music featuring jamz from the artists we love. Each half-hour long block will feature a single artist, handpicked by our own station members. Haunting melodies, emphasized by the isolated, tortured lyrics of its lead vocalist, Ian Curtis, became a trademark of the group. Ian Curtis, an epilepsy sufferer, was prone to breakdowns and seizures while on stage — it became difficult to distinguish the fits from his usual on-stage jerkiness and manic behavior.Two days before Joy Division was to embark on their first US tour (May 1980), singer Ian Curtis committed suicide by hanging. Hear it: Blue Velvet & Black Coffee with Patrick, Tuesdays 2-4 p.m.
CMU Carnival means Buggy on WRCT!